Ethel: Yeah. Something like that Cole Porter song�Friendship. Isn't that a wonderful idea? Lucy: Well, no. That way I don't get to sing alone. Over the course of two stellar seasons of I Love Lucy, Lucy Ricardo (Lucille Ball) has been an awfully busy bee. She locked herself in a meat freezer; got a wee bit tipsy pitching Vitameatavegamin on TV; stuffed herself with chocolate candy to keep pace with an out-of-control conveyor belt; and after a frenetic departure for the hospital, gave birth to Little Ricky. The latter event climaxed the show's second season, and garnered astronomical ratings for CBS. It also provided the writers unlimited fodder for Season Three, as the newest addition to the Ricardo family brought with him a host of fresh complications rife with comedic possibilities. Credit, however, must go to Bob Carroll, Jr., Madelyn Pugh, and Jess Oppenheimer, for refusing to let Little Ricky grab the spotlight. It would have been far too easy (and ultimately tedious) to focus every single episode on the rigors and pitfalls of childrearing, no matter how many madcap premises the trio of writers could wring from the situation. Thankfully, they were all perceptive enough to realize the success of I Love Lucy hinged on the relationship of Lucy and Ricky (Desi Arnaz), and their interaction with friends and landlords Fred and Ethel Mertz (William Frawley and Vivian Vance). While a baby could add some spice to the mixture, too much attention on the adorable tot would ruin the dish. So although the impact of Little Ricky can be felt in such episodes as Ricky Minds the Baby, in which Ricky proves his ineptitude as a babysitter, and Baby Pictures, which pits Lucy against a good friend for cutest baby bragging rights, the child remains a definite fringe character, allowing the slapstick antics of the adults to continue to take center stage. Which they do in such classic installments as Lucy and Ethel Buy the Same Dress, in which the girls bicker over who gets to wear the glamorous gown they've both purchased for a TV appearance. To preserve their friendship, they both vow to return the dress, but then each can't bear to part with it, and arrive at the studio in identical garb. As they warble Cole Porter's clever tune Friendship, they rip each other's duds to shreds! In Lucy Has Her Eyes Examined, a trip to the ophthalmologist ruins Lucy's flawless jitterbug routine in Ricky's show by making her vision so blurry, she can't see her partner, while Lucy Tells the Truth finds Ricky and the Mertzes wagering $100 that Lucy can't last a whole day without telling a lie. All goes well until Ricky takes his wife to a TV audition, where a fib gets her cast as a knife-thrower's target. And in The Million Dollar Idea, a personal favorite, the girls decide to market Ethel's marvelous salad dressing from a recipe by her beloved Aunt Martha. A television commercial prompts a cavalcade of orders, and Lucy and Ethel can barely keep pace with the demand. But when Ricky informs them that they're actually losing money on each bottle, they decide to stop the financial hemorrhaging and go back on TV to quash interest in the product�with hilarious results. Several episodes can't compete with the above gems, but all are entertaining and magnificently showcase the stars' comedic gifts. As usual, the writing consistently sparkles, but it's Lucy's masterful physical comedy that lifts many episodes to classic status. And despite changing times and tastes, the battle-of-the-sexes premise remains all-too-relevant, and more than 50 years after these shows originally aired, the lovable friction between Lucy, Ricky, Fred, and Ethel still strikes a chord, and makes the laughs resonate. No doubt about it, Season Three is a charm. Lucy and the gang continue to tickle our funny bones and produce dozens of genuine guffaws as they define that overused term, "classic TV." Image Transfer Review: Once again, Paramount has done a marvelous job restoring and remastering all 31 episodes of Season Three, and the transfers trim years off the shows. Clarity is exceptional, and the rich blacks and wide gray scale lend this collection a stunningly fresh look. A few of Lucy's heavily patterned dresses produce some shimmers, but almost no age-related defects intrude, and edge enhancement seems altogether absent. Paramount deserves kudos for continuing to lavish meticulous care on this iconic series. Audio Transfer Review: The mono audio has never been more than average, but Paramount technicians have nicely tidied it up, erasing any surface defects and making sure all the clever repart�e remains clear and comprehendible. Some of the audio can sound tinny and shrill (an unavoidable problem that also afflicts the DVD editions of the first two seasons), but Arnaz's songs possess a full-bodied tone, as does the familiar title music. Extras Review: Paramount includes all of the same goodies on this new set of discs that enhance the previous season collections, including numerous flubs, lost scenes, restored music, original series openings, original animated sequences, script excerpts, invaluable supporting cast bios, and some fascinating production notes that discuss "the most risqu� [joke] ever to make it past the CBS censors," the contributions of director of photography Karl "Papa" Freund (still being employed on sitcoms today), and how sponsor Philip Morris originally sought to limit the number of musical sequences Arnaz could perform on the series. Five complete episodes of Lucy's radio show, My Favorite Husband, which spawned I Love Lucy and provided inspiration for many of its scripts, are included, as well as an audio excerpt from Laughs, Luck�and Lucy, producer and head writer Jess Oppenheimer's memoir, read by Larry Dobkin. Other rare supplements include a couple of post-episode promos for Lucy and Desi's big-screen comedy The Long, Long Trailer, a public service announcement for The March of Dimes and its effort to wipe out polio, and a special Christmas message in which Lucy and Desi ask viewers to donate to their favorite charities over the holidays. A slide show featuring 16 black-and-white images from various episodes completes the extensive extras. 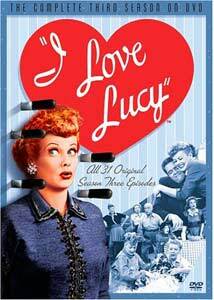 Paramount continues to salute I Love Lucy and the genius of Lucille Ball with another terrific box set. Beautifully remastered episodes, a wealth of rare material, and handsome packaging make this collection another must-own for fans of Lucy, the series, and classic television. Highly recommended.